This is My Pace: Joseph James is here! I obviously haven't written in a couple of weeks. Last week they pushed the date up and we went into the hospital on Thursday evening. Born Friday, June 4th, at 12:29 pm. 7 lbs 3 ounces, 20 inches long. He's beautiful, and I find it difficult to put him down. He is named after both of our maternal grandfathers. It was a very emotional experience, I think much more than the typical delivery. It was such a relief to put this stressful pregnancy behind us and finally hold Joseph in our arms. As much as I tried to keep the deliveries seperate, it was natural to think of Andrew. With both boys, I went in at 36 weeks and delivered at 36.1. 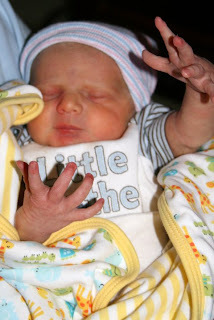 Andrew was actually longer at 21 inches, but weighed less at 6 lbs, 11 ounces (I think he lost weight at the end). All 3 kids have the same mouth. It's a lot to process. The freshness of the new love for a newborn made us realize, again, how much we missed. Then you throw in the hormones, and goodness, I'm still a bundle of a mess! More to come later, I have to get back to holding my baby. Congratulations!!! So happy for you and your family!!! He is such a handsome little man!!! He's beautiful! I'm so happy for you!! As stated.. Beautiful.. Proud of you Kerry and so thankful he is here.. Hope you got my basket of goodies... Miss you and pray for you and your family a lot.. now go hold that baby..
Oh he is so handsome! Congratulations!!! Kerry, he is such a handsome little guy. You're in my prayers as you continue to grieve Andrew and welcome your new little one into your family.